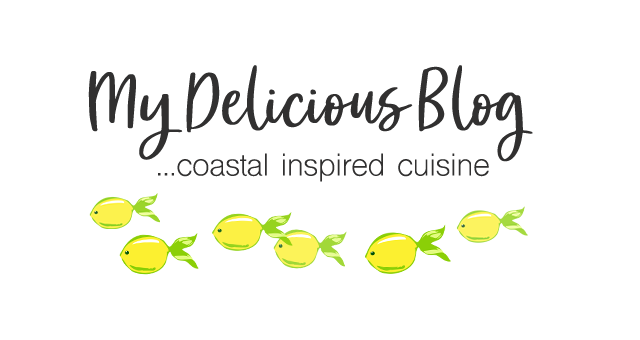 I love to learn how my circle of foodie friends is preparing fresh fish, which is why I was excited to read my friend Danielle’s recent post on her beautiful blog Suwannee Rose. 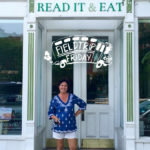 Danielle grew up in Florida so she’s no stranger to fishing and cooking with all the beautiful produce that grows in her own backyard. 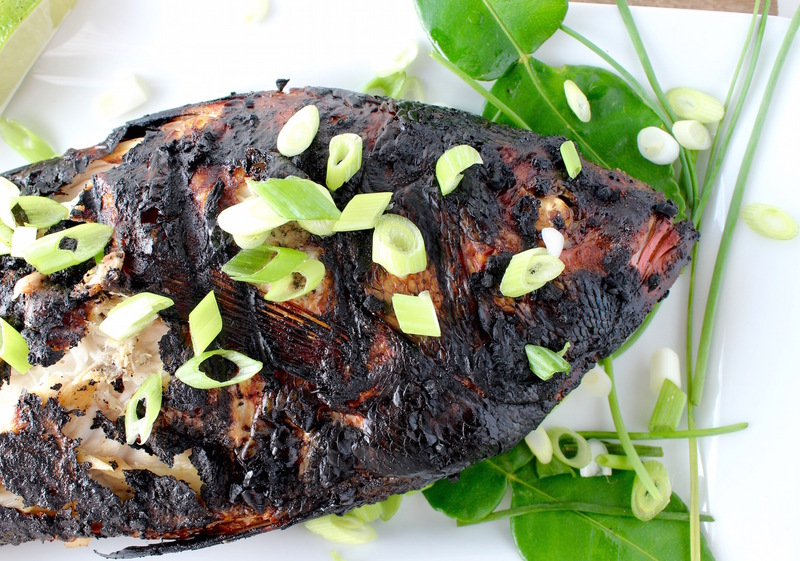 Check out her post to learn about this Indonesian recipe called Ikan Bakar (pronounced “ee-khan bah-car”), which translates to “burned fish.” Sounds a little scary, but it’s oh-so-tasty. 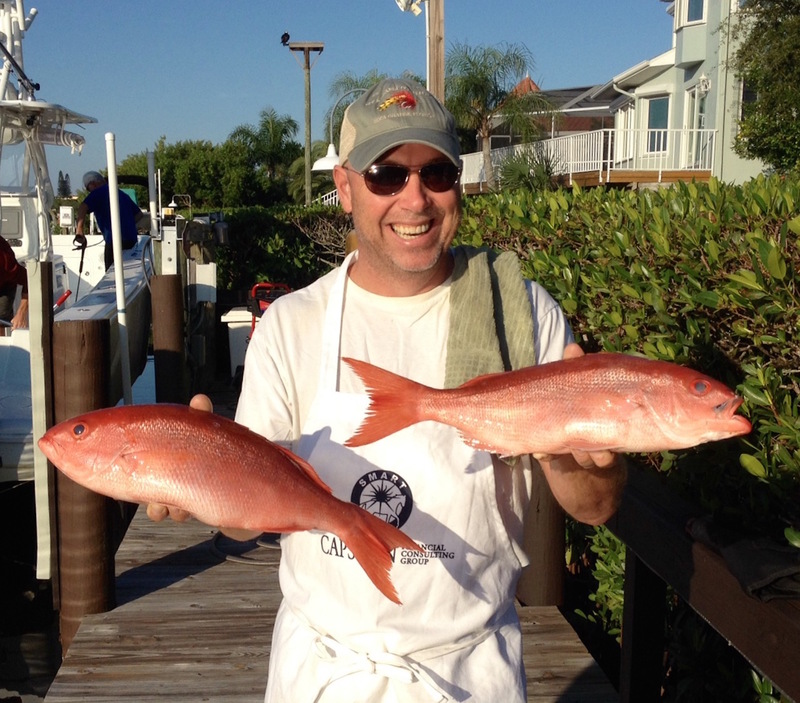 On my recent fishing trip we caught a bunch of American Red Snapper, along with others in the Snapper family, including Vermillion, Lane, Mangrove and Yellowtail. The 1-2 pound size is perfect for cooking whole, which is exactly what I did with a Vermillion Snapper recently. Here’s my hard-working hubby with two beauties — they’re bright red and look a little like an American Red, but much smaller. 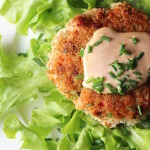 Like most in the Snapper family, this fish is sweet, mild, flaky and SO delicious. The Ikan Bakar recipe intrigued me because of one of its marinade ingredients — Makrut lime (sometimes called Kaffir or Thai lime). I had never heard of it, so of course I did some digging. Turns out this gem in the citrus family originated in Asia where both its fruit and leaves are used in cooking, but it’s the leaves that are most prized. 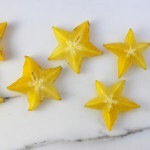 The double leaves (see above pic) are packed with essential oils, offering the most fragrant and distinctly beautiful flavor – sweet, tangy, bright and spicy, sort of a lime/lemon/orange combo – really amazing. I was excited to give them a try, especially after Danielle mailed me a package of them from her own tree! It’s nice to have friends who grow amazing fruits and veggies 🙂 Fresh leaves are ideal, but if you can’t get your hands on them, simply check out your local Asian market — they usually have them in the frozen section (since they only last a few weeks in the refrigerator). Note: In Sarasota, I’ve seen them at Oriental Food & Gifts in the Gulf Gate area. 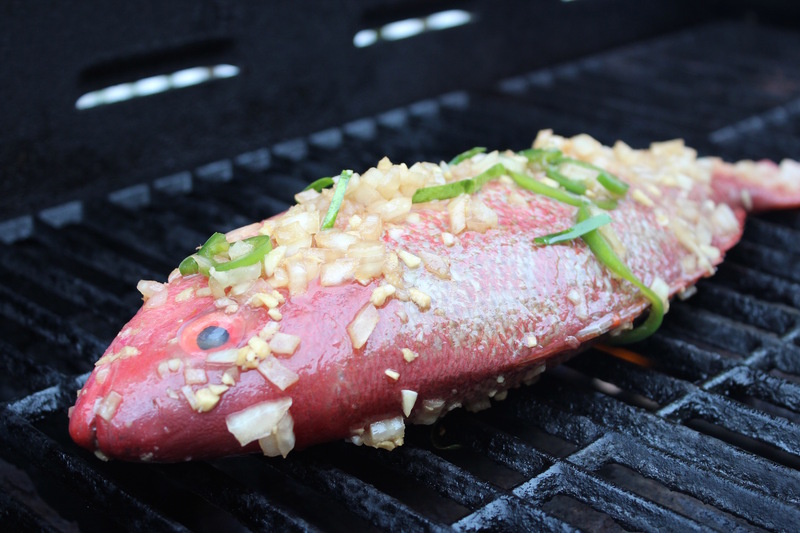 This recipe is quite easy – after marinating the fish, place it (along with the tasty marinade) on a screaming hot grill. Cook for about 4-6 minutes each side (depending on the size/thickness of the fish), then let it cool a few minutes. 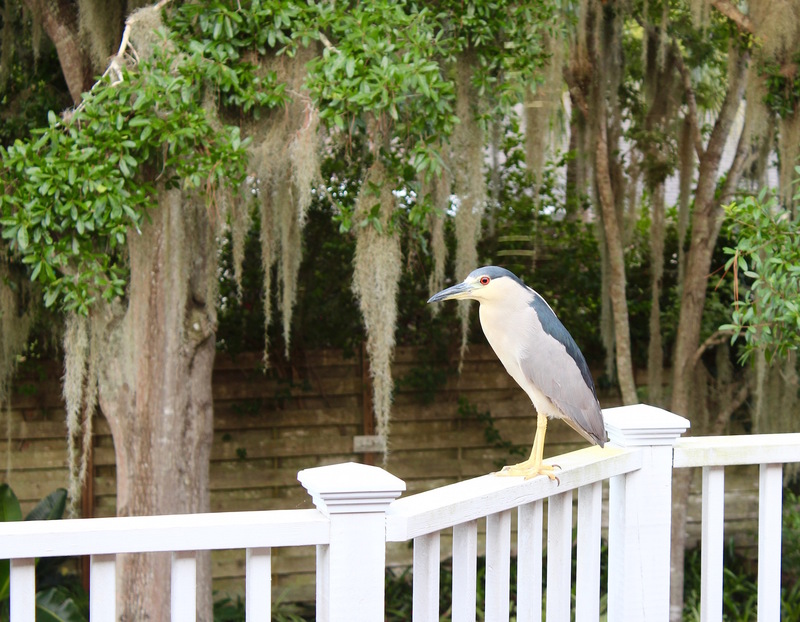 While ours was cooling, this Night Heron stopped in for a visit. Thankfully, I got the fish away from the grill just in time. . . When ready to serve, just peel away the top side of the fish (skin and meat) careful to leave the bones behind. If you can, try to remove the skeleton in one piece, then work your way to the other side’s meat. 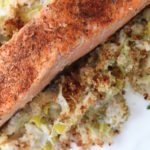 It’s very easy with two people – my husband and I didn’t even use forks because it was more fun to pull the tender white meat away from the bones with our fingers. What savages! 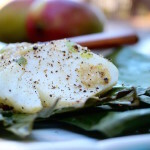 Burned fish is oh-so-tasty when prepared with the flavors of chile, ginger, garlic and Makrut lime. Rinse and pat dry the fish; set aside. In a large 2-gallon ziplock bag, combine kecap manis, grapeseed oil, onion, peppers, ginger, garlic, lime leaves. Add the fish to the bag, ensuring that plenty of marinade gets into the cavities of each fish. Prepare your grill and ensure the grates are clean. Dip a paper towel into some grapeseed oil and wipe the grates a few times to season them. When the grill is very hot (our gas grill was about 600 degrees), place the fish on the grate and cook for 4-6 minutes (depending on thickness). When edges are charred, use a spatula to gently lift the fish and turn it. Cook the other side for about the same amount of time. When the edges are charred and you can easily slide a skewer though the thickest part of the fish, it's ready. 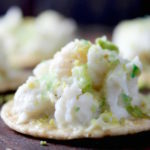 Garnish with herbs and lime leaves. If you don’t have kecap manis (pronounced keh-chup mah-nees), check your local Asian market. In a pinch, though, a decent substitute is regular soy sauce, with a generous amount of brown sugar mixed with a bit of molasses, so it becomes syrup-y. Who knew that the words Burnt and Charred would be used in a gourmet recipe! I feel that I can succeed in making this recipe already! You’ll definitely succeed with this one, Wendy 🙂 Not only easy, but mighty tasty. NICOLE, HUGE B-LINERS HOW DEEP WERE THEY?? WERE THEY WHERE YOU CAUGHT THE ARS?? YOUR BOAT OR CHARTER?? YOUR RECIPE SOUNDS GREAT! WE HAVE DONE THAI STYLE WHOLE FISH AND IT’S GREAT! WE HAVE BEEN EXPERIMENTING WITH THE OCTOPUS (SPANISH) FROM WHOLE FOODS AND HAVE DISTILLED A RECIPE THAT I WILL EMAIL SOON. BOUGHT THE PANKO AND HAVE WISCONSION (REAL FARM) BACON IN THE FREEZER AND WILL TRY YOUR BACON GROUPER SOON. WOW!! This does look delicious! Glad you both enjoyed it and the bird didn’t get to steal it. Loved all the pics. We’re glad that bird didn’t steal it too! I am so honored, Nicole!!! Thanks for spreading the word about my favorite whole fish. Actually, it sounds like you guys ate it in the traditional Indonesian fashion as well, with your hands! Love the picture of the night heron, too.